How to call a Doberman? The Doberman breed is considered versatile dogs give birth to watchdog, investigative and guard service, as a companion and bodyguard. Despite the formidable appearance and large size, the Doberman will not give much trouble, he will be a friend and reliable defender of the family, girl or even a child. The Doberman is a young breed, its history began more than a century ago by Friedrich Louis Dobermann. 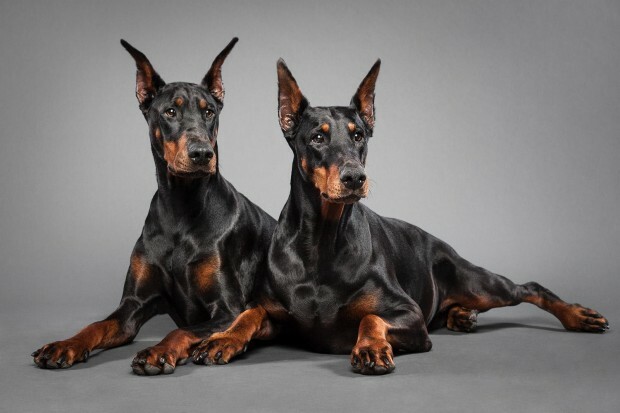 Despite the fact that officially, the breed Doberman appeared in 1880, its founder started breeding much earlier. Friedrich Louis Dobermann lived in the small German town of Apold, worked as a policeman and tax collector. For the service he needed a loyal, strong and fearless dog. Among the existing species that are not found, so we decided to bring a new one. In his mind the ideal dog must be medium size, have a smooth coat, which requires thorough care, quick response. She needs three qualities: aggressiveness, intelligence and vigilance. Breeding Doberman Friedrich bought a house and gathered a group of friends. We used several breeds of dogs: hunting, mastiffs, German shepherd dogs, blue dogs, old German Pinscher, the Beauceron, the Rottweiler. But the most important thing in the selection of dogs were not breed and working qualities. As a result of long work on the removal of the breed of the dog, which initially was called the Thuringian Pincher. In 1894, they renamed the Doberman Pinscher, and then, in Dobermans. Doberman brought a vicious breed of dog, which many feared. To buy the Doberman could take a family with children, Otto Heller, a little changed the character of these animals, soften their intransigence and spite. Dobermans as a new breed officially unveiled in 1897 at the show dogs in the city Aporte. In 1899 the club was formed "the Dobermann Pinscher", and in 1900 he became a national. By this time, Germany had over 1000 specimens. The most famous Doberman – dog-Bloodhound Clubs. He was born in the legendary nursery Otto Heller "Von Thuringer". During his life he helped in revealing more than 1,500 crimes. In the twentieth century thanks to the canine V. I. Lebedev Dobermans became popular in Russia. The first nationwide test of police dogs, which took place in October 1908, was attended by Clubs that have shown brilliant results. Russian breeders have gained Doberman puppies in Germany and engaged in breeding. In 1925 he created a Section of fans of Dobermans and German shepherds", on its basis held exhibitions and demonstrations. If till 1940-ies these dogs are often used as sappers, bombers and paratroopers, in the future they have practically ceased to recruit, was replaced by a German shepherd. Now breed the Doberman can not be called popular. Not many are willing to be in the apartment a large and energetic dog, and captive maintenance of these animals is not suitable, since they have no undercoat. But those who dared to raise a Doberman, fall in love with this breed forever.